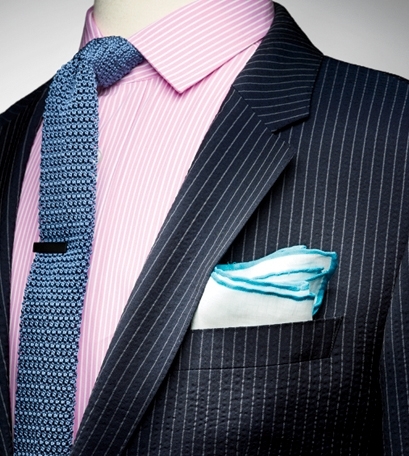 Summer is a great opportunity to add more variety and color to your pocket square arsenal. Even in the most conservative of environments, this small detail is a great way to reveal character and personality. The combination of pocket square with outfit is still a point of pain for some gentlemen. If this is a concern that affects you, let's ease your fears. There is only one rule that you should remember - do not match your necktie with your pocket square. Chant this to yourself repeatedly if need be. The matching combo is never a good idea past the age of 5 and even that is pushing it. Personally, I like the advice of using the square to complement (not match) your necktie or better yet, your shirt. Use this rule if you are unsure about the proper way to match playful pocket square colors with solid or patterned shirts or neck wear. The real key is to find a combination that makes you comfortable and speaks to your personal sense of style. To get your mind thinking on potential combinations, check out a few variations I personally like. These looks were featured in GQ and can be recreated or accented by our team of style experts at Devlon Paris.